Within the second and the third half-cycle a large percentage of all the vortices are spherical. These are the negative dimensional vortices, and the domain of the orbs. Orbs are vortices of not one possible class but several possible classes. Orbs can be bridges or tunnels, spirals, and one orb can be a combination of several vortex classes connected to form one vortex. It is not known yet which of all the vortex classes can be orbs. A vortex can be identified as an orb by its near-perfect spherical shape. All orbs look identical in shape, but the outer surface can look different in texture, and the path of movements (meridians) of each orb is unique. Orbs can belong to different half-cycles, can be low dimensional (yang) or high dimensional (yin), and can have different properties and characteristics. Despite that it appears that there are a wide number of types of orbs that exist, very few have been successfully identified, and those that have been identified have not been identified with full certainty. Their classification is still prone to error. Orbs are vortices that still need to be explored and properly classified and mapped within the correct locations within the transformation sequence. Because a sphere is a very basic shape and many objects can be spherical, it takes some caution to determine whether an observation of something that is spherical is an orb or not. It takes some time to determine whether the shape of some physical object is that of a basic vortex or not, but eventually we can always find the answer if we think widely, look for clues in all possible directions and take the time to merge all these clues together. We find spheres everywhere in our natural world, from the microcyclic level to the macrocyclic level. Below you can see a collection of images that show some spheres found in nature in the macrocyclic, mesocyclic and microcyclic. Not all of these are guaranteed to be orbs. The first characteristic that suggests that these shapes are orbs is a near-perfect spherical shape. Any visible stretching along one or two axes lowers the possibility of the vortex being an orb. Of all the examples above, the star, the planet and the pearl in an oyster shell is an orb. The other examples are less certain to be shaped by the movement of an orb, but the possibility is still all of the above are shaped by orbs. The least likely is the hedge apple, because there are no examples of fruits that are shaped by orbs, berries and melons are not related to orbs. Because orbs are vortices, and vortices are known to sometimes show a behavior called angularity (for this you need to see the page about angularity), it is likely that orbs too can appear in an angular form. So if we assume that these orbs exist, then how would these angular orbs look like? Although it is not certain which angular phenomena are orbs, there is a good possibility that some angular orbs are shaped as cubes. The obvious reason for this is that a cube is an angular shape whose size is uniformly distributed as best as possible in all directions. In this case it means that the width, height and depth of the cube are the same. The image above shows a few pyrite mineral crystals on a piece of marl. These crystals are not cut or processed by man, the crystals as you see in this image are naturally formed. It is very likely that the shape of these crystals and how these were formed was the direct result of vortex movement during a slow process under high pressure. And it is somewhat likely that the vortex movement that created these cubes can be classified as the movement of an orb. If that is true than other angular shapes that approximate a perfect sphere by being as much as possible uniform in size in all directions could also be orbs with an angular property. These shapes are known as regular polyhedrons. I say 'if', because so far this is an assumption, not a proven theory. It might be that an orb that lacks the minimum number of movements has a different shape then a cube or any regular polyhedron. A bulb vortex for example, which is also close to spherical, does initially not become angular when it lacks the number of movements (meridians) to complete the full shape. The first reaction to the lack of meridians is that the bulb starts to bend, like a bean. Eventually the bulb does become angular, but alongside with a further bending of the vortex. Orbs too might behave different under the condition of the lacking of movements than what is assumed here. Thus these cubes could be orbs in which the number of movements (meridians) is lower than the minimum required number of movements and thus the roundness of the shape can no longer be achieved and the geometry is forced to take on an angular form. The image above shows one possible theoretical direction of movement for a spiral orb (direction of the green bands). This is a hypothesized shape only, no such movement has been seen yet. What matches most the movement in the image above are the spiral patterns seen in some cacti (but the shape of a cactus is not related to any of the orbs). Here it is a simple spiral pattern on the surface of a sphere, but It is expected that most orbs will have a more complex movement than this, with a combination of different meridians (movements), in most cases braided, and can differ greatly from what you see in the image above. Still, if an orb is a spiral, then it is to be expected that the movement of some of its meridians will form a spiral pattern in one way or another. Spirals can be orbs and orbs can be spirals, or orbs can be a combinations of two spirals with a bridge or tunnel. Because there are spirals within the negative dimensional side of the sequence, it is a good possibility that there are also ladders in that same side of the sequence. Orbs that are located within the same half-cycle form a sequence together as vortices that encapsulate each other as layers of increasing size. One orb encloses the other, preceding orb. If some of these vortices that form the layers of larger spherical sequence should be classified as spirals, then there's a good possibility that in between two such subsequent spirals we can find a ladder, one that connects these two spirals. For now we can name this hypothesized vortex an 'orb ladder'. How such a ladder could look like is shown in the illustration below. It is possible that this is how a ladder could look like, but it is not certain. A reason why I think this could be how an orb ladder looks like is because there are multiple observations of spheres with spikes or tentacles stretching out from it in all directions. If a vortex should fill the gap between two spirals then this vortex could be the one to do just that. Still, it could be that the spikes or tentacles are a diffused form of another vortex that failed to form because of the lack of required movements. In that case these elongated vortices are not part of an orb ladder, but a cluster of vortices of a different class. Pollen from a variety of common plants. Image by Dartmouth Electron Microscope Facility, Dartmouth College. Plasma Globe. Image by Colin (Wikimedia), under CC BY-SA 3.0 license. The plasma globe is a fine example of two orb layers being connected by a vortex of a different type. Here it is assumed that the tentacles that fill the gap between the two spheres is a ladder, thus an orb ladder. Spherical gamma ray spectrometers are used to study rare and exotic nuclear physics. They are used to measure properties of gamma rays and to study the existence of the heaviest elements, nucleosynthesis in exploding stars, and other phenomena like the atomic nucleus. One such device is GRETA, shown in the image below. GRETA is build by Berkeley Lab's Nuclear Science Division (NSD), which has been a leader in building high-resolution gamma-ray detectors. Because gamma rays are located within the fourth half-cycle (second cycle) of the transformation sequence, which is a negative dimensional part of the sequence, it is a logical consequence that several of the vortices that are linked to gamma rays are orbs, and thus spherical. The device you see in the image above looks like an orb with a ladder. It is unlikely that this shape is a coincidence. Detecting a specific wave from a specific part of the electromagnetic spectrum requires building a device that utilizes the shape and movement of the vortices that belong to that part of the spectrum. In this case, the vortex is an orb, because the waves to be detected lie within the gamma ray part of the spectrum. Planets are shaped by the movement of an orb. At a macrocyclic scale, planets are orbs. At smaller scale sizes they're made up of different vortex types. It is likely that one of the first orbs that is located at the start of the second half-cycle is a tunnel orb. Because it is also likely that the second half-cycle is where the shape of a planet is formed, it could be that some layers of a planet are also formed by a tunnel. A tunnel always connects to one or two spirals. It could be that the outer layer of Jupiter is also such a spiral-tunnel-spiral formation. I say this with caution because the exact classification of the type of orb for any planet is not certain at this moment. It will take more investigation and looking for clues and answers before we can tell for sure what shapes the outer and inner layers of the planets within our solar system. But one thing I can say for sure, planets are orbs. It does appear that Jupiter has a different kind of outer layer than the earth. So it could be that the make-up of layers present within a planet can differ for each single planet. Moons can also differ in the make-up of layers, but might also be shaped by a different part of the sequence, in another cycle. Because moons do not differ greatly in density as compared to its parent planet, it is most assumed that they are formed by the same half-cycle. The name orb is used for an optical phenomenon that occurs in flash photography. This is where I derived the name from for these vortices. These optical orbs are spherical artifacts that appear on photographic images especially those made with modern compact and ultra-compact digital cameras. These artifacts are usually white or semi-transparent, but may sometimes also show a color spectrum. The two images above are screenshots from a video clip. These orbs are not artifacts on the lens of the camera, but they are real physical objects that float in the air. These objects are vortices. They are very high dimensional, and therefore not visible or tangible for human beings. One of the things to be aware of is that in some photographs you can tell that the orbs are located at different depths from the camera, and that the orbs are also located behind objects within the scene. The orbs are occluded by objects within the scene. Orbs are not artifacts within the camera lens. For a better understanding on why these spherical objects are vortices within our own environment we need to look one step further. We need to look at a few other phenomena that are closely related to these orbs, but that are larger in size. Rainbows, fog bows, halos and glories are optical and meteorological phenomena that are caused by light changing its course of direction when hitting the surface of an obstructing medium. The result of this change of route is the formation of a visible arc or full circle in the sky. This arc (or circle) is only visible when the viewer is standing in front of the arc, and is only visible from one direction. Rainbows form a color spectrum and in most cases no more than half a circle. A fog bow is similar to a rainbow, but appears in fog rather than rain and is almost white, with a faint red outer edge and bluish inner edge, or as completely white. A halo forms a complete circle, and like the fog bow it is whitish with different possible faint colors. A glory forms a full circular disc with a color spectrum. Orbs that occur in flash photography show some remarkable similarities with rainbows, fog bows, halos and glories. These much larger optical phenomena also appear in two color varieties, as a white color and and as a color spectrum. And here too the circle is only visible if the light source, circle and observer are aligned. The order in which the three should be aligned depends on the type of phenomenon. In all of these cases the light-source, orb and observer are located on one straight line. Rainbows always appear in the section of the sky opposite to the sun, the shadows from the viewers position point towards the rainbow. In the case of a glory, The light-source too is located behind the viewer, and because of that in some cases the shadow of the observer is cast onto the glory, which becomes a visible phenomenon known as 'brocken spectre'. In the case of a halo, the orb is located between the light-source and the observer. Whenever you see a halo, you also see the sun at the center of the arc. If the arc and the sun are not aligned relative to where you are standing, then you can not see the halo, the arc will fade away if you move too many meters in the left or right direction. A halo can not be looked at from the side, it can only be looked at from the front. The light is cast from the sun, passes by the orb, and continues its way before reaching the observer. Obviously something must be happening with the light as it reached the orb, that creates the visible phenomenon known as a halo. The reason for why a halo appears is that there is a spherical vortex, an orb, floating in mid-air, that can not be seen or detected by human sight or by a normal camera lens without flash. The light from the sun is refracted on the outer edge of the orb, thereby changing its direction by 90 degrees, and then continues inward in a motion that creates an annular shape. The light is only refracted by the orb if it hits the outer surface of the orb at an angle of nearly zero degrees. What we thus see is an annular vortex, a type of belt vortex, that is created by the light rays that are refracted on the outer surface of the orb. Thus there are three type of vortices present in the vicinity of the halo whenever such a phenomenon is visible in the sky. First is the light, which is also a vortex. Second is the orb, which is not visible or tangible. And third is the halo, which is the only one of the three that has a visible shape. Thus a halo is not an orb, but it sort of makes the orb visible. Its center position is the exact same center position of the orb, and its outer edge is also the same to the outer edge of the orb. By looking at a halo you know exactly where the orb is located, except for the depth towards the viewer. It is not possible to estimate the distance from the observer to the orb or halo, and not possible to estimate its size. All we can say is that it is likely that the sphere floats within our atmosphere. The inward motion of the light after it has been refracted continues on beyond the visible halo towards the center of the arc, and center of the sphere. Only close to the outer edge the halo is visible, but sometimes you can also spot a color difference, difference in luminosity, between the sky inside the halo compared to the sky outside of the halo (this also occurs at rainbows). Only in rare occasions we see a halo, only in rare occasions this annular shaped vortex forms itself in the sky, but the large orbs that are part of the cause as to how these halos form could be less rare in occurrence then the halos. The large orbs can be present in the sky more often without us being aware of, because only the right weather conditions, combined with a perfect alignment with the sun, can create a condition that creates a visible halo. This is not unusual, because we know that there are many other type of vortices present in air that are in most cases not visible to the human eye. Take for instance the vortex sheet behind an airplane. So, now that we know how a halo is formed, we can formulate a definition of a halo, to briefly describe the phenomenon. Because the halo and thus orb does not appear to move but instead stays in the sky for a long time, we know that these orbs are very high dimensional vortices. In the higher dimensions movement runs slowly, and thus these vortices have a long lifespan, and move slowly. They are also invisible and intangible, which is another indication that these vortices are high dimensional. Much of what is said about the halo also applies to the rainbow. But a rainbow does not float in the air, a rainbow connects to the ground. Instead of forming a full circle arc it only forms somewhat less than half an arc. You might have already started wondering about why this sphere connects to the ground, and why it is only half a circle that we see? For this you need to look at soap bubbles, and how they connect to each other, or to some surfaces, to understand why a rainbow is half a circle. When a small soap bubble connects to a large soap bubble, then the large bubble stays intact but the small bubble is capped. The reason the same thing happens with a rainbow is because the earth underneath, our planet earth, is one big orb. So the orb that causes the rainbow is capped by the orb that is our planet. If you look very carefully then you will notice that the smaller soap bubble that is connected to the larger soap bubble is not precisely half a sphere. It is a bit less than half a sphere. The exact same thing is true when we look at the shape of a rainbow. The arc does not reach 180 degrees but falls a bit short of that. So, the definition of a rainbow is for a great part the same as that of a halo. If the orbs indeed follow the same rules as the other vortices found in the positive side of the transformation sequence, then there are some predictions we can make about the orbs by following the same rules as these other vortices. We know that all spirals that we found so far have a single, double and binary version (see page about the spirals). If some types of orbs are spirals, then it is likely that they too have a binary form. Thus two spirals that are mirrored and facing each other with a bridge in between that connects them. If we look for something that matches this description in rainbows then we do find something that does exactly that: double rainbows. Double rainbows rarely form, but when they form they show a dim secondary rainbow outside the primary rainbow. The colors of the second rainbow are inverted compared to the primary arc. The area between the primary and secondary arc is called Alexander's band, after Alexander of Aphrodisias who first described it. This area is somewhat darker than the sky around the outer arc. There's a good possibility that these two arcs are caused by light refraction on a spherical orb that has formed a binary spiral. Each of these arcs is produced by one of the two spirals that make a binary structure, one is left-turning, the other is right-turning. The area in between, the Alexander's band, is where the bridge is located. You should compare this scenario with a binary scroll ring, which is made up of two spirals and a bridge in between, yet at first glance it doesn't look like there are two spirals. At first glance it looks like you are looking at two toruses. Same here with these large spheres. They look like spheres, but they could be spirals, and in that case they would not be recognized at first glance as spirals. The way that a large sphere is connected to a smaller sphere is how one end of a binary spiral connects to the other end of a binary spiral. And this is how two rainbows can appear, because each of the two ends of the binary spiral creates one rainbow. As a comparison: a binary disc spiral can form within the cross-section of a revolute, we've already seen an example of such (fluid ejected from a tube by a piston with added dye, see page about the outer bridges). And a binary swirl can form within the cross-section of a binary scroll ring, for that we've also seen an example (hydrogen bubbles in a vortex sheet, also on the page about the outer bridges). It is likely that this phenomenon here is closely similar. If this optical phenomenon occurs here on earth, at both small and large scales, then it could hold true that this same phenomenon also occurs in outer space, at yet a bigger scale level. Many of the vortices seen so far here on earth can also be found through the lens of the Hubble telescope. So it is likely that there could be orbs floating out there in space. And if there are large orbs here on earth that cannot be seen with the naked eye, then the same could hold true for the realms of outer space. There could be orbs out there that can be made only visible by means of the refraction of light. Image by ESA/Hubble & NASA. Image was cropped. So when looking for a phenomenon in outer space that shows similar characteristics with rainbows, fogbows, halos and glories, one that could potentially been formed by an astronomic sized orb, there's one phenomenon that comes to mind as being a potential candidate for that. And just as with the rainbow, here too we can find a double ring version. Below is a Hubble image of the only double Einstein ring ever found, which was announced in 2008. And here again, the outer ring is fainter than the inner ring, same as with double rainbows. Another phenomenon in outer space that is likely to be the equivalent of a rainbow in outer space caused by the presence of an orb, are the antennae galaxies, also known as NGC 4038 and NGC 4039. But here it is not one, but two orbs that are causing two visual arcs. And the light does not appear to come from a star far behind the two galaxies, but from a bright object at the center where the two galaxies touch. These are said to be a pair of interacting galaxies that are undergoing a galactic collision. To great extend this statement is correct. Except that the collision has already taken place and the two objects are now continuously merged as one. The two orbs could have been two separate orbs that have merged by colliding, just as two soap bubbles can merge when they collide. The shape of the two arcs is an exact match with the way that two soap bubbles merge after colliding with each other in mid-air. There are some observations of geometric shapes in nature that are possibly orb vortices that haven't been classified yet. The obvious thing to look for is a spherical shape. But whether a sphere is an orb should be determined by one or more of a variety of methods. Not always there's all the information required to give a satisfactory answer. Here I will discuss two observations that could potentially be orbs. This mysterious huge bubble cloud appeared over Beijing and the surrounding area in August 2011. Dozens of people spotted the glowing object, which gradually grew larger and fainter. The entire occurrence lasted for less than 15 minutes. "At first, it's relatively small and bright, the upper part is something like a semi-circle, a spherical ring of light, it's obviously becoming bigger and bigger then," said an observer at the Beijing Planetarium. Chances are that what we are looking at is an orb. Somehow the unique weather conditions, which could be small droplets of water suspended in air, made this phenomenon visible. Large orbs like this form in our environment more often than we are able to see them. 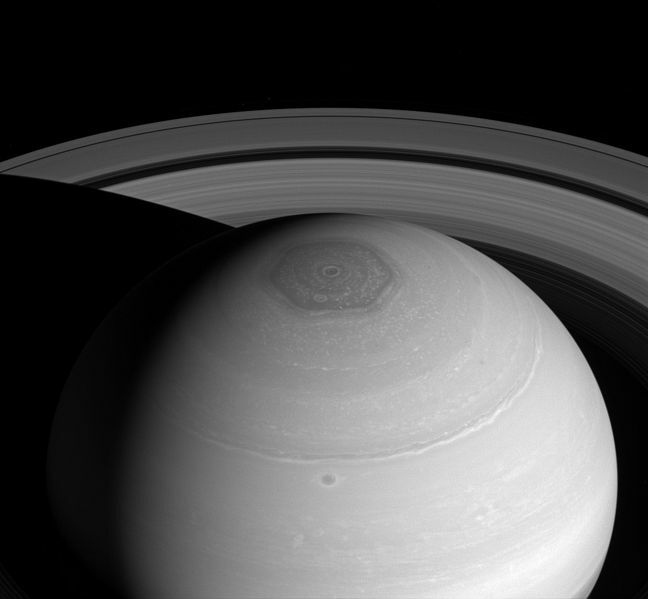 Saturn's hexagon is a persisting hexagonal cloud pattern located around the north pole of Saturn. Each of the six sides of the hexagon is about 13800 km long, which is longer than the Earth's diameter. It rotates with a period of 10 hours, 39 minutes and 24 seconds, the same period as Saturn's radio emissions from its interior. However, the hexagon does not shift in longitude like other clouds in the visible atmosphere [text from Wikipedia, slightly edited]. For an explanation why this vortex is angular, read the page about angularity. It kind of looks like this vortex wraps itself around the planet so it could be a full spherical vortex, an orb. In that case it could be that the entire outer layer of the planet is comprised of this vortex. If not so than this vortex is just like a large hurricane storm here on earth, a relatively small vortex on a local position on the planet. The fact that the vortex is located exactly on the north pole of Saturn suggests that it is a part of a larger orb, with the center axis of the planet being the center axis of the orb. You can watch a short clip about this hexagon below. Today it is believed that mass causes gravity. The more mass objects have the more the objects pull on one another. According to Isaac Newton and his law of gravitation, any two objects in the universe exert a force of attraction on one another. The magnitude of this force is determined by the mass of both objects and the distance between the two objects. The greater the mass of the two objects and the shorter the distance between them, the stronger the gravitational force between them and thus the stronger they pull on each other. Yet this theory by itself does not explain all that happens in the presence of gravity, or within the absence of gravity. In the international space station, all objects have almost zero gravity. Yet because there is little influence from earth gravity, one would expect that the influence of the objects mass would play a role, and there should be some attraction of objects within the space station that is the result of the mass of those objects. Yet in reality, this does not happen. Objects inside the international space station do not attract one another, no matter how much mass those objects have or what size those objects are. You can watch the video below to see an example. The claim that mass causes gravity is not entirely correct. Mass plays an important role with gravity but gravity is not caused by mass. Otherwise a heavy object inside a space station would attract small objects at least to some degree. Instead, gravity attracts mass, and gravity is passed on by the mass which it attracts. The object to which the gravity is passed on then also becomes a source of gravity, yet with a force that is always smaller, and can not be greater than the force of gravity created by the source of which the gravity was inherited. The distance to the source of gravity determines the amount of gravity that is passed on from the source to the target. Furthermore, the more an object is pulled by the gravity of a source, the less that object is attracted by another object that is attracted by that source. If gravity is passed on from source A to object B and from source A to object C, then that same gravity can not be passed on from object B to object C or vise versa. The same gravity can not be passed on twice to the same object. The maximum force of gravity is always that of the source. The more object C moves away from source A, and thus the more the gravity passed on from source A to object B is greater than than the gravity that is passed on from source A to object C, the more object C can be affected by the gravity from object B. But the amount of gravity that is expected to be passed on from object B to object C will be smaller than what could have been if the object had been attracted by the source A. Gravity, which is a inward movement from all directions to a single center-point, only originates from spherical bodies, and so far the only celestial objects that have shown to do that are planets and stars. This inward movement belongs to the orbs, only orbs produce gravity, and its only limited types of them that that do. Thus the source of gravity, are the orbs. A good way to demonstrate this is by looking at magnetism. Which works on the same principles. If you take one ball that is a magnet, which is made of ferrite, and put it next to an iron ball that is not a magnet, then the iron ball will be attracted by the ferrite ball magnet. If you place another iron ball next to the first iron ball, that that ball will be attracted by the first ball, yet the force of attraction is not as great as with the attraction of the first iron ball by the ferrite magnet. A small note here: magnets are not necessarily ball shaped. I only used ball shaped magnets in this example to hint in the direction of thinking in the same way about the motion of planets around the sun. The difference with this example however is that in the case of the planets and the moons, those orbs probable also produce gravity, so the force of attraction is stronger. In this example all four spheres would then be magnets. The motion of the stars in spiral galaxies, and any other galaxy, is not caused by gravity, but simply by the force of the vortex movement just as with a hurricane. The stars are simply following the flow of the vortex. Gravity is one type of vortex movement, but so there are many other types of vortex movements for many different types of vortices. All those other vortex movements do not involve gravity. If we want to successfully understand the movements we observe of astronomical objects, we need to make a clear distinction between gravity, which is one type of movement, and movements that are not caused by gravity. At this moment in history astronomers are still used to think only in terms of gravity, because we ourselves live on a planet, and within a star-system, where most of the movement is influenced by gravity, gravity of our planets and moons and the gravity of our sun. When we move away from our solar system, we will need to abide to new laws of movement, which will entice us to revise our way of thinking. There must be at least one vortex that creates gravity. The most likely location where gravity comes from, and thus where we can find this gravitation vortex, is on the negative side of the sequence, on a central balance point. This could be the negative dimensional antipode of the bulb or the central balance point of the second upper half-cycle or the first lower half-cycle. The most likely candidate for that is the tunnel vortex that connects to the negative dimensional antipode of the bulb. It appears that the movement of gravity is a fall to a single point, but it is not sure if it truly is a single point. It could be that the gravitational pull comes from a solid sphere or hollow sphere, and that the pull ends at the surface of the sphere. For the earth, for example, this gravitational vortex could be one of the earths layers at the depth of half the radius of the planet, and this is probably the layer with the largest volume (not the largest radius), because there's a good chance that the central balance point lies somewhere close to that. This is unknown at this moment.